Paella is a traditional spanish dish that is absolutely delicious! This warm spiced dish will fragrant your home and fill your belly too! Sadly, I usually don’t eat paella when I’m out because it most often has pork in it :(, but my version is made with chicken and shrimp so no fear fellow poultry/seafood only fans! The earthy saffron and sweet paprika add delicious flavor while the peas and asparagus really brighten it up. Tip: Make this on a Sunday and enjoy the leftovers for a couple of days. Salt and Pepper chicken and place in an oiled large nonstick skillet over medium heat and cook 3-5 minutes on each side then remove from pan (use a pan that does not have a coated handle). 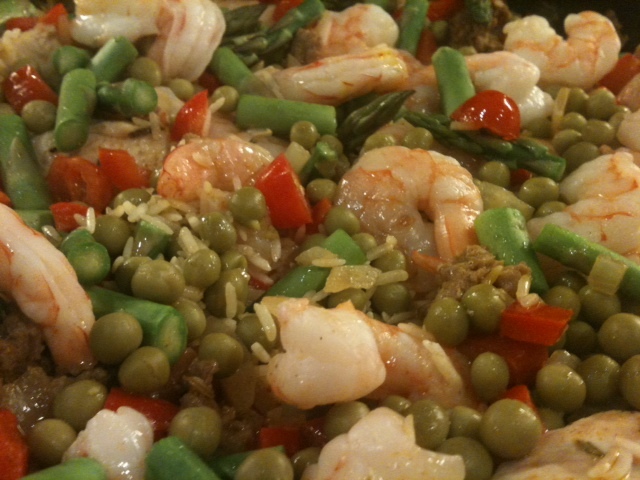 Add asparagus, peas, and shrimp to skillet, cover and bake until rice is “al dente”, garnish with parsely.